I found these flowers at the Museum of Fine Arts and I thought they looked pretty good and couldn't resist posting them for my birthday. Those are mighty fine birthday flowers! The vase is lovely, too. Have a beautiful day, and may your year ahead be filled with happiness and good health. Beautiful flowers, nice setting, great occasion. Happy Birthday! Happy Birthday, Clueless. Thank you for letting us share the day with you. Hope it unfolds in a wonderful way, and that the year to come brings many happy adventures. A most Happy Birthday to you! Enjoy. 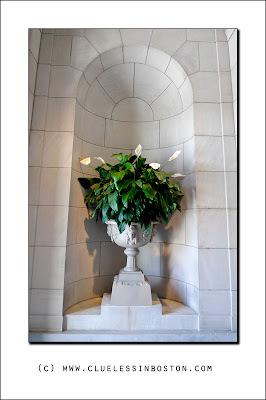 I think those are peace lilies and they are so pretty! I hope you have a wonderful birthday! may your birthday be as delightful as all of your pictures. Hope you have a great day and I hope the temps in Boston are more bearable than down here in Charleston. Happy birthday, honey. May many more beautiful bouquets and birthdays come your way . . . They are a perfect gift to yourself - and us! Happy Birthday! And Happy 4th! Magnificent! Congratulations for so wonderful post! I love the white on white. Such a cool and regal photo. Wish you a very, very Happy Birthday. Happy birthday!!! Hope you have a wonderful, fun weekend! Happy Belated Birthday, Clueless! Hope you had a fine day with fine arts. Well I missed your birthday too. So sorry - bad bout of bronchitis with asthma but getting better now. I love your photo and perfect for a birthday. Hope it was a good one.